Post news Report RSS	Let's talk about Crossroads Inn's expansions! Dear Backers! We made it! $26.000 lagged behind and we are not stopping until we get the $30.000! Thank you for the enormous trust you have placed in us! Today we want to talk a little more about the development of the game after it will be published. We are planning to keep adding extra features to the game for at least a year after the actual release. Those will introduce new equipment, tavern objects, new meal receipes, materials and whatever it takes to run and enhance a legendary inn. 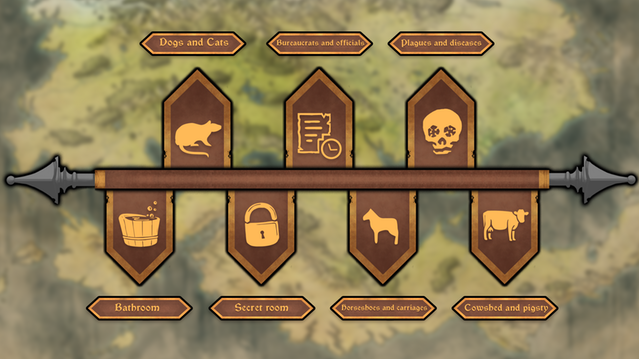 Those will contain new story-driven scenarios, new NPC's and new mechanics which will diversify the game itself e.g. illegal gamblig den! During the development of the game We had a lot of new ideas that we needed to throw away because we wouldn't be able to publish the game on time. That's why we've put them into additional content. We also want to make game alive and community engaged long after the game release. It's really important to get your feedback in that matter. So please don't hesitate to comment on this update. Is there to much of this content? Or maybe to little? What kind of content would you like to see? What can we do to make it better? This is still an open subject for us so all suggestions will be taken into account! A DLC that gives the player the opportunity to have a dog or cat in an inn. You can have more than one pet, but their encounters end in a fight between them and possible damage to equipment/furniture. In order to keep a pet in an inn, it is necessary to have a bed or a kennel for him and to feed him regularly. A neglected animal simply leaves the inn. Animals have special functions: cats hunt rats - in the room where rats are located they never appear, while dogs bark bandits. If a dog appears in an inn with the intention of theft and encounters a dog, he barks at him and forces him to leave the inn. This DLC will introduce special characters, Officials, who will visit your Inn. Among them you will find: sanitary inspectors, tax collectors, judges, notaries and many more. Like in normal life, a visit from an official may cause you some troubles... but there is also a chance of gaining some good money or... respect! It doesn't sound nice, right? Well, it won't be pleasant at all but... on every misfortune you can earn some good money! This DLC will introduce different diseases and mental illnesses. Both clients and your employees will be susceptible to diseases. There will be a way to cure them -with the plagues, two special characters will appear - an herbalist and a feldsher. You will get a share from their work! Bathroom is an additional room that can be built in your inn. Introduces for customers the possibility of taking a bath, using the sauna, massage, stained glass beating. The bath can be arranged in three different styles: Yorevale (like the Roman terma), Untermarchia (Russian bubble), Sambria (Turkish Hammam). If there is a bard in the inn, he will visit the bathhouse regularly and give his poems here. If there is a courtesan in the inn, it will also provide its services here and generate a higher income. The bathhouse gives you the opportunity to earn extra money by providing services available in it. Additionally, it reduces the number of illnesses in the inn. There must be a stove at the bathhouse. The "Secret Room" gives the opportunity to build an underground floor. The entrance has a hidden character (sliding wall, hidden flap, etc.). The supplement introduces the mechanics of municipal police raids. If the secret entrance is open during the visit of the guards of the law, they confiscate all equipment placed in a secret room, stick a fine and cause the loss of reputation. To increase the security of illegal business, you can make a secret exit through an underground corridor leading beyond the inn. In the secrets room you place a fighting arena, an alchemist lab or a kidnappers stash. This addition introduces the stable building and the blacksmith's workshop. Thanks to this we have the possibility to receive guests with horses in the inn. These animals are another attraction of the addition. We take additional payment for taking care of the horse. There is also a possibility of accepting the carriage if the player builds a place for him. Visiting guests with the carriage is associated with a big profit. This addition also allows you to create a special box for the Griffin. Maintaining the stable requires importing or producing hay, which is stored under the wall. Here, your employees also go for a walk. At the stable we can build a blacksmith's workshop. This addition makes it possible to build a barn and pigsty. The player breeds new animals: cows, sheep, goats and pigs. 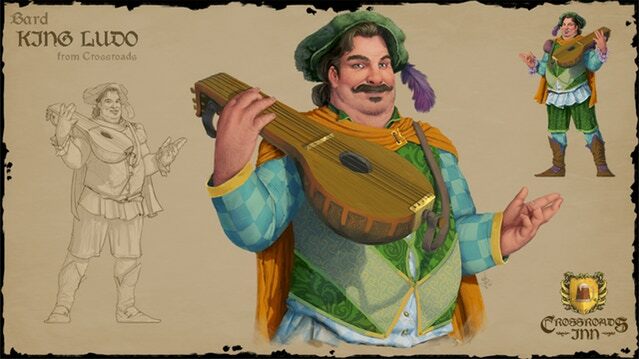 Each DLC will introduce special bards, vedetas and adventurers as well. In the pledge of $65 among others you will get a season pass for all the content we will be releasing. Please, keep in mind that this is just a sneak peak and you can expect much more from us!